Water Wise: What Wine Grapes Varieties Are Most Efficient? Grape production is one of the most important agricultural commodities in the USA and is threatened by global warming. This is particularly relevant in a semi-arid state such as Nevada with a rapidly growing population competing for scarce water resources. Abscisic acid, a plant stress hormone, regulates water use efficiency and drought resistance in plants. This proposal addresses which winegrape cultivars are most water use efficient and seeks to select genotypes varying in abscisic acid production that can be used to improve water use efficiency and drought resistance. V. vinifera grapevines grow well in arid and semi-arid environments. V. vinifera L. has relatively high drought tolerance and genetic variability within the species exists. Once established in a deep soil with adequate water retention characteristics, grapevines produce root systems many meters deep enabling the vines to survive severe water deficits. However, global warming is causing significant climate change, making it necessary for future crop adaptation. Increased temperatures along with changing rainfall will require improved crop performance under water deficits. These facts are particularly relevant in a dry state like Nevada. There is a wide range of water-use efficiencies between grape cultivars. These differences are largely attributed to variation in stomatal conductance in response to water deficits, but also can be related to differences in the change of root hydraulic conductance and aquaporin (water channel) expression in response to water deficit. Furthermore, there is significant variation in abscisic acid (ABA) concentrations between rootstocks originating from different Vitis species and which have an influence on scion (V. vinifera L. cv. Shiraz) photosynthesis and stomatal conductance. 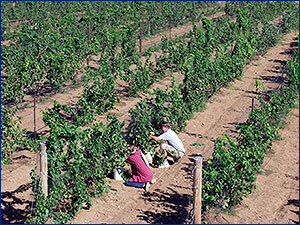 ABA has an active role as a regulator of grapevine responses to water deficit. Water deficit increases ABA concentrations in the xylem sap and leaves of grapevine and changes in stomatal conductance are well correlated with ABA concentrations of the xylem sap. ABA is also influences hydraulic conductance, aquaporin gene expression and embolism repair in grapevines. ABA is essential for the drought resistance of plants and has multiple actions including the reduction of transpiration, an increase in hydraulic conductance and the biosynthesis of osmolytes. ABA in the xylem sap is a key root to shoot signal in drought-stressed plants. Other chemical signals that may influence stomatal conductance during water deficits include malate, protons, cytokinins, and ABA conjugates. Peptides and proteins may also act as signals in the xylem. Metabolites, peptides and proteins have been analyzed in the xylem sap of maize. Protein concentrations are affected by water deficit, however, ABA was considered the most important signal in the xylem sap that regulates transpiration. Small RNAs play significant roles in abiotic stress resistance, including drought resistance. However, the role of peptides, proteins and µRNAs in the xylem sap remains unclear and requires further investigation. Evaluate the viticulture characteristics and wine quality potential of clones of economically significant cultivars throughout the USA. Characterize the viticultural and wine quality potential of emerging cultivars based on regional needs. Conduct explorations within and outside of the USA for new or lesser known cultivars that may have economic potential for the US wine industry.